Home → Osteoarthritis → Keeping your skeleton strong to support a healthy active life! Make Enerex Cal Mag your formula for keeping your skeleton strong to support a healthy active life! Poor nutrition, mineral absorption, stress, excess acidity, lack of exercise, low parathyroid hormone, low estrogen, sunshine exposure, and vitamin D levels are some of the factors that cause loss of Calcium and other essential minerals from bones. This can create tiny pits and holes that make bones weak, brittle and less dense. This is osteoporosis. 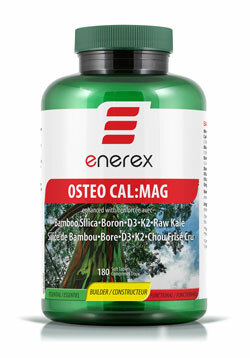 The form of Calcium and it’s team of co-worker nutrients in a supplement has a huge effect on it’s ability to be absorbed and utilized for proper development and maintenance of the skeleton. A base of raw organic kale to provide maximum mineral absorption and combat acidity in the body — perhaps the missing link to osteoporosis prevention.